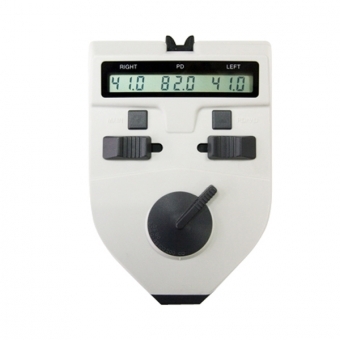 PD Meter is a digital precision optical instrument used to measure distance between human pupils in the process of optometry. 1、It features consecutive measurement, direct point-sampling and high accuracy of orientation, with mechanical hairspring being used to level at the reflecting point of human cornea. 2、It adopts linear sensors of high precision, highly intellectualized electronic system and digital display of measurement results which is more accurate, direct and easy to read. 3、The design of LED lamp-house and low power-consumption makes the battery life prolonged. 4、The brightness of LED is adjustable. 5、+2.0D compensation for the degree of eyesight is available. About 1 minute after stopping operation, or turn it off manually.